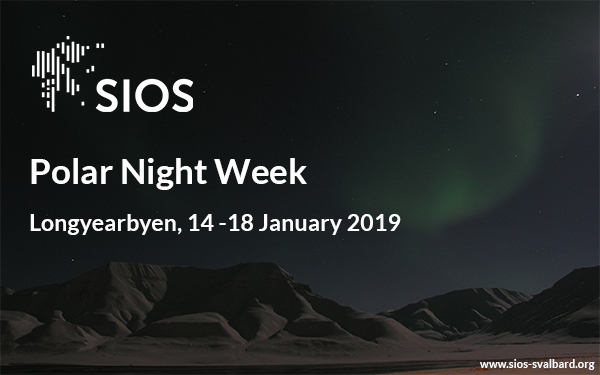 We are happy to announce that the first SIOS Polar Night Week (PNW) will take place in Longyearbyen, 14-18 January 2019! The Polar Night Week will be an arena for exchange, reflection and planning of future activities and we expect a vibrant atmosphere in the middle of the beauty of the Polar Night. There is no charge for attending Polar Night Week for SIOS members, but you will need to cover your own travel and accommodation costs, as well as meals other than lunch and the conference dinner. If you come from a non-member institution please contact us for details about the participation fee. Please find more information in the menu on the right-hand side.